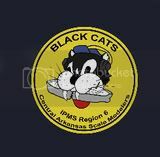 IMPS Charter Renewal: Charter renewal process has completed. 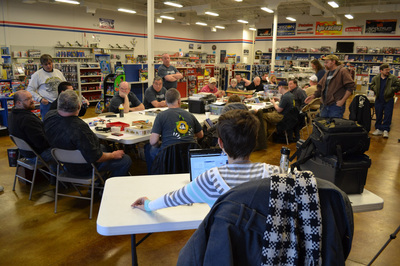 By-Law Revisions: Suggested revisions from the E-Board and general club membership were discussed. 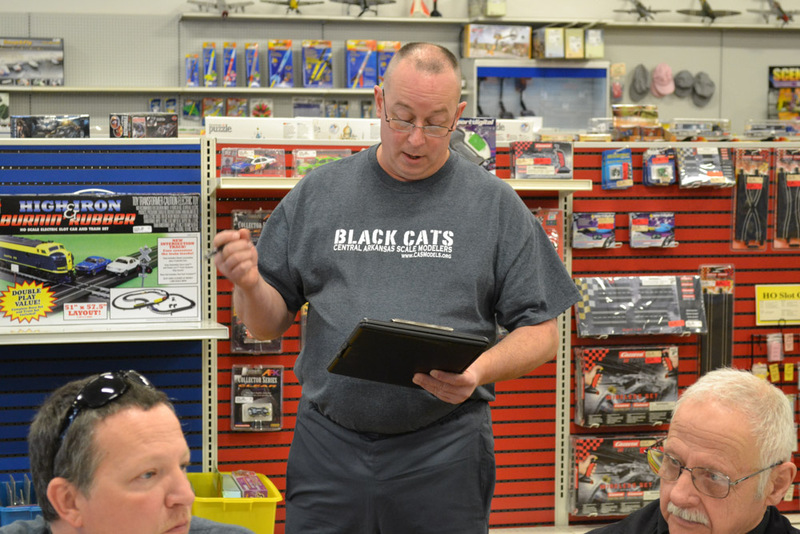 Changes to the by-laws were made as needed and the revised by-laws will be put before the club for review in February and voted on in March. 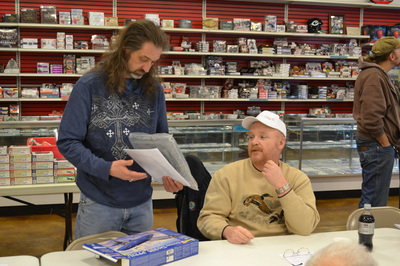 Club Interest Survey: The club interest survey forms filled out by members during the January meeting were discussed and the overall interest ranking was presented. 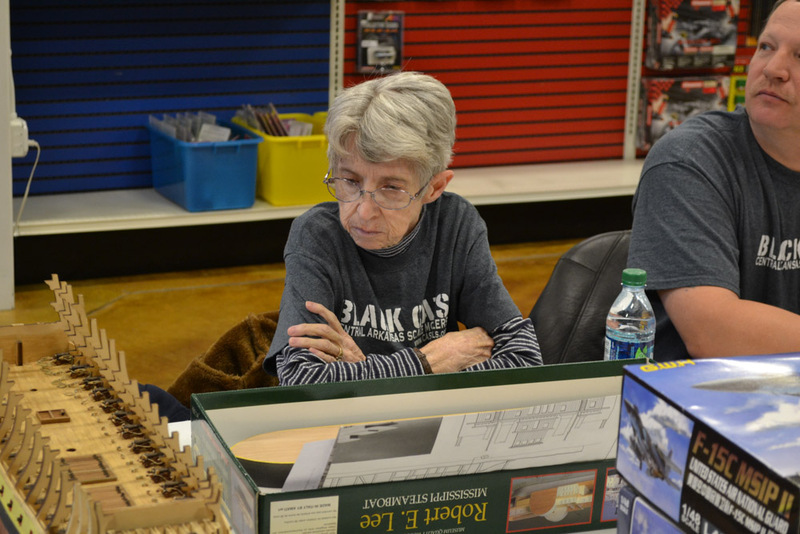 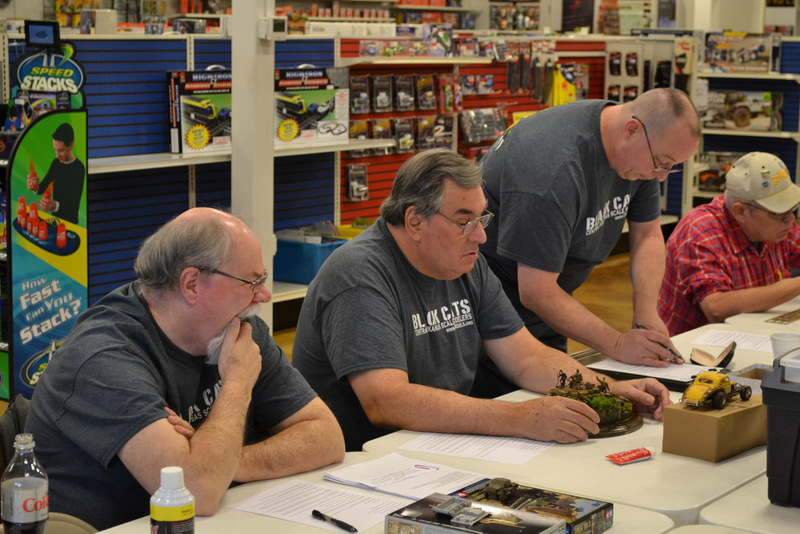 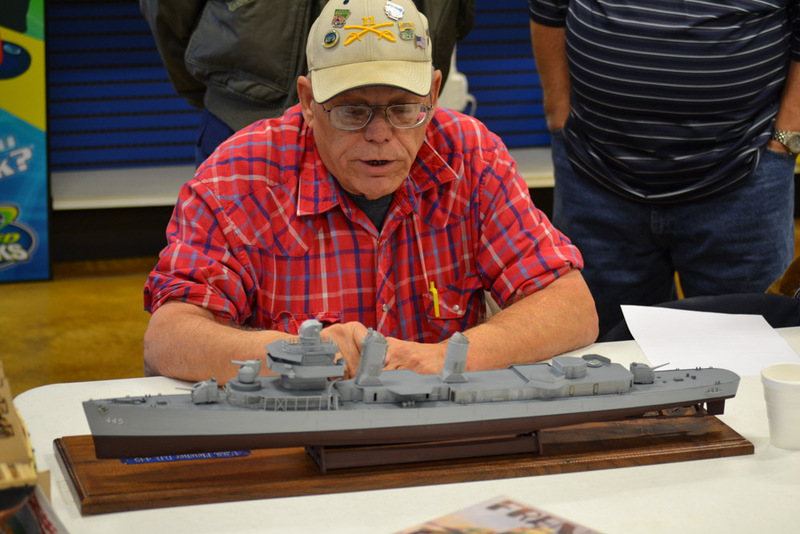 2017 IPMS Nationals: IPMS has sent out invitations for hosting the 2017 National Contest. 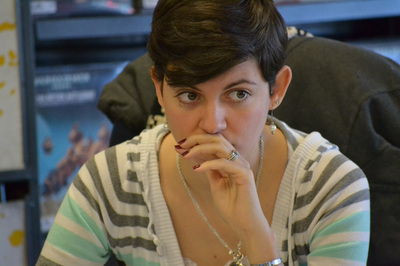 Advantages and disadvantages of hosting the competition were discussed. Further discussion is tabled for the time being. 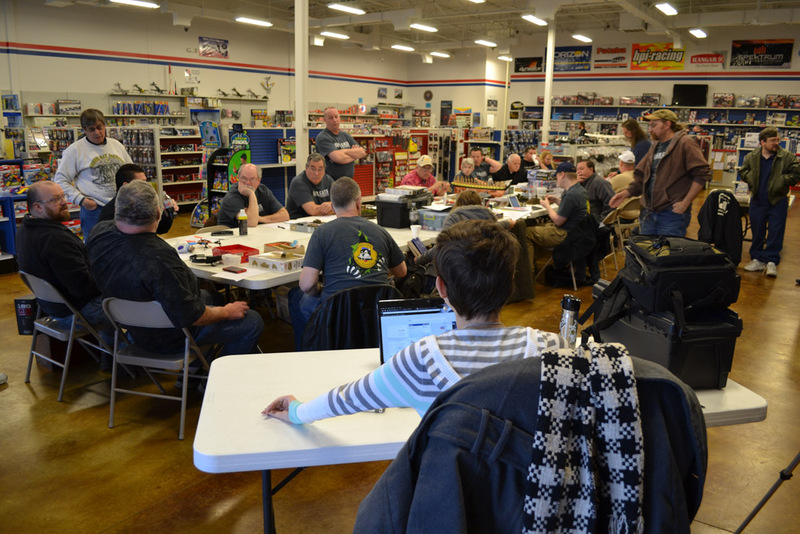 Chapter of the year: Items for submission to IPMS Chapter of the Year were discussed. 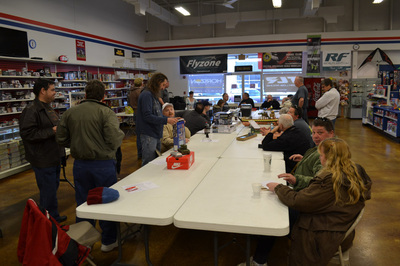 The meeting was adjourned at 12:25. Present: Matt Bond, Ralph Breshears, Richard Buzbee, Tom Brown, Cliff Bullock, Brianna Childres, Ken Childres, Matt Dillow, Brian Elliot, Roy Elliot, Kenneth Faucet, Robert Garton, Bob Hiatt, Mona Hiatt, Lloyd King, Rick Knapp, Ron Leker, Sam Macheak, Kenneth MacLeod, David Mizda, John Montgomery, Rusty Nail, Ray Smith, Joshua Swift, Mike Warren. 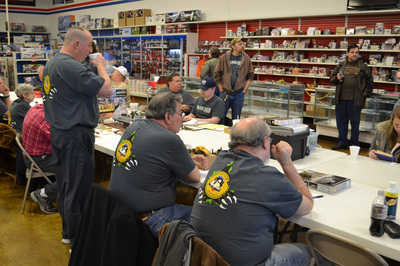 Sproo-Doo Show Theme: The show theme for this years Sproo-Doo was discussed. 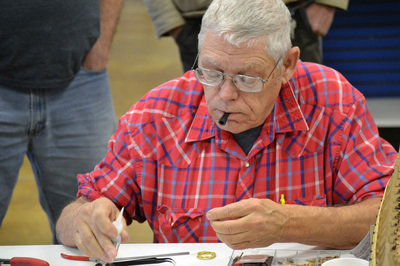 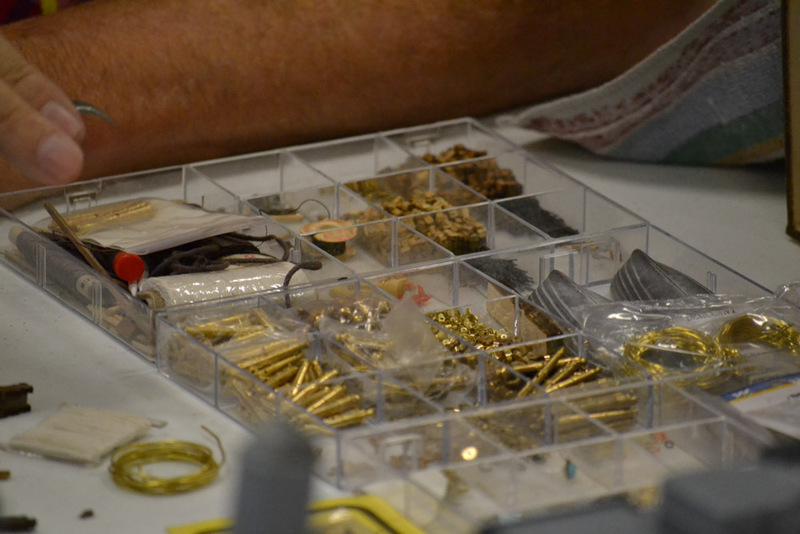 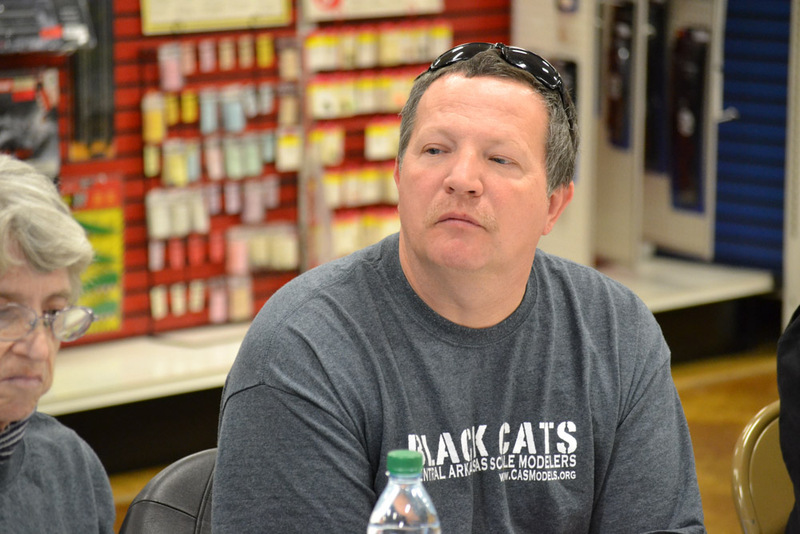 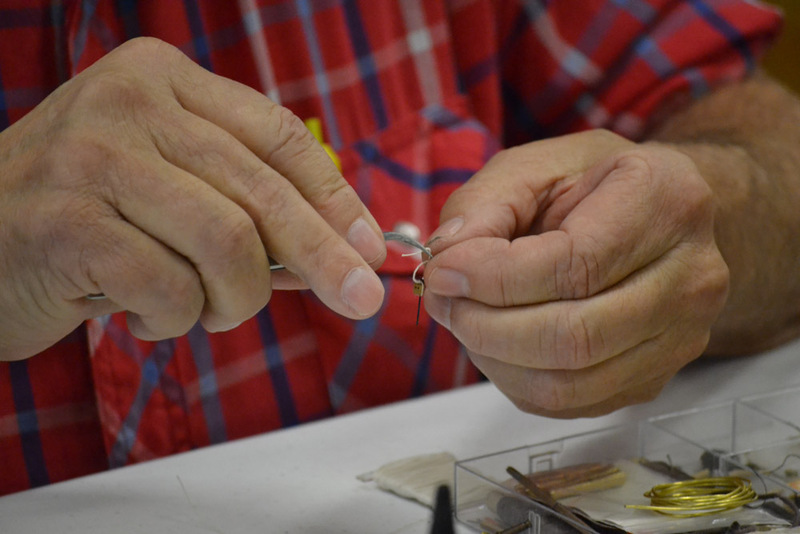 Several suggestions were put forth by Steve Wilson, Ron Leker, Bri Childres, and Bob Hiatt. The club voted and “50 Shades of Green” by Steve Wilson was selected. CASM Forum: The old CASM forum has been shut down. 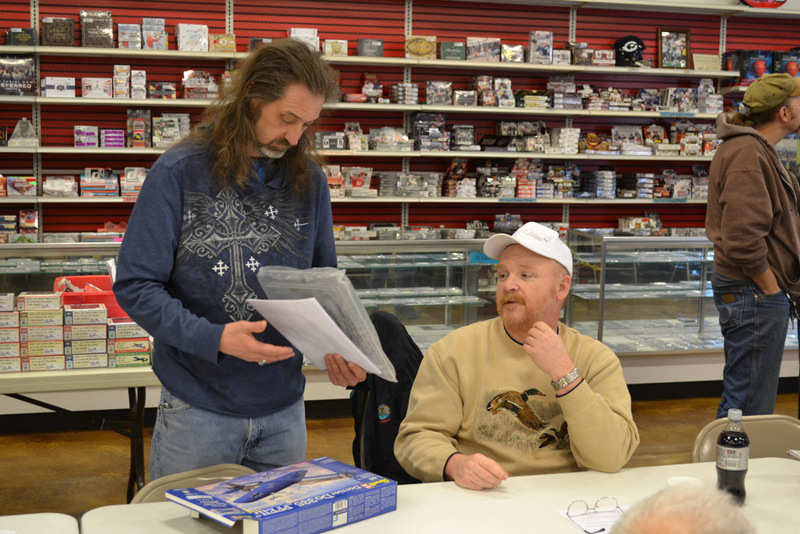 Bri presented new forum options to the club; an enhanced Facebook page that would allow members to post articles and messages and would cost no money, and a new web forum that would be similar to the previous forum but cheaper. 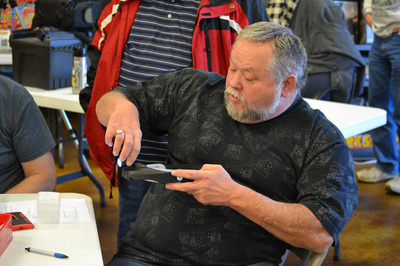 The club voted for the enhanced Facebook page. 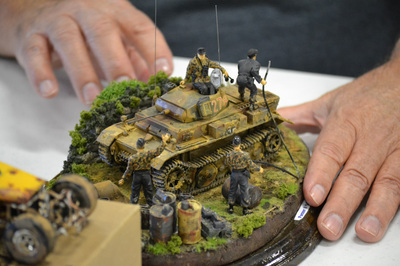 The club’s page is https://www.facebook.com/groups/CASModels/. 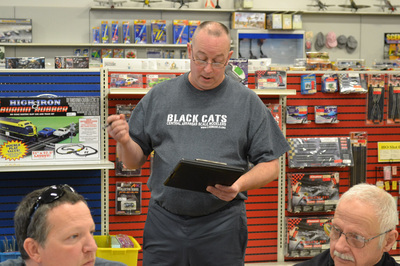 Annual Membership Survey: Matt Bond presented the annual membership survey to the club. These forms were filled out and submitted by members present. Electronic copies were also sent out by club contact Mike Warren. 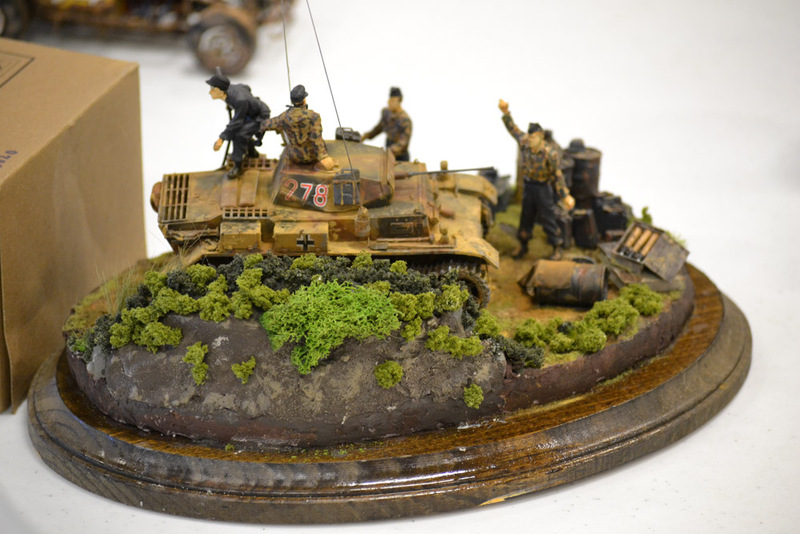 These can be emailed to any Matt at mdbond68@gmail.com. July Group Build: The next group build will be due in July. 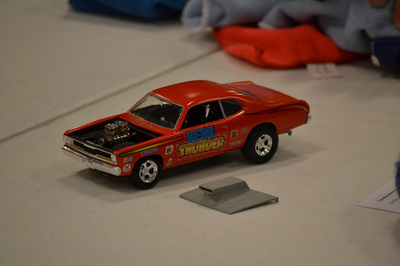 The theme will be “Wrecked”. 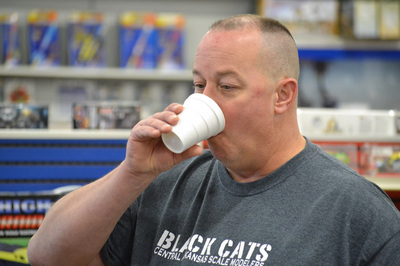 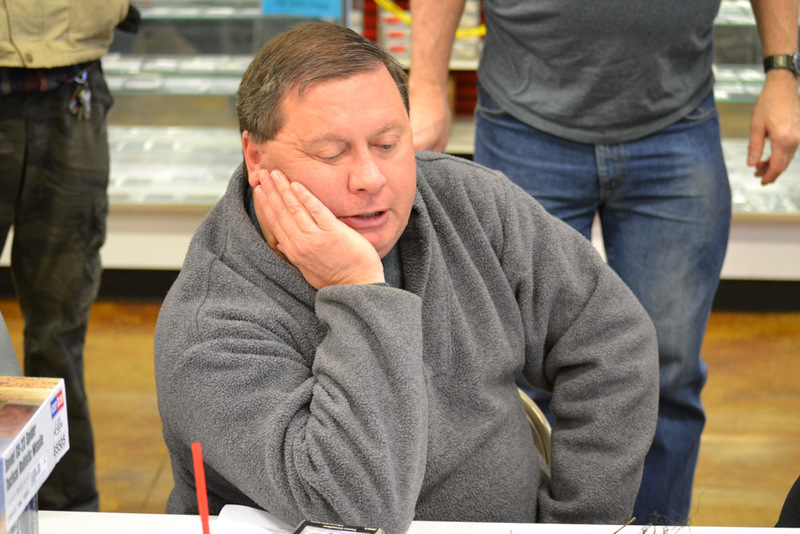 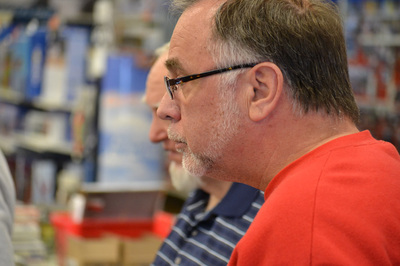 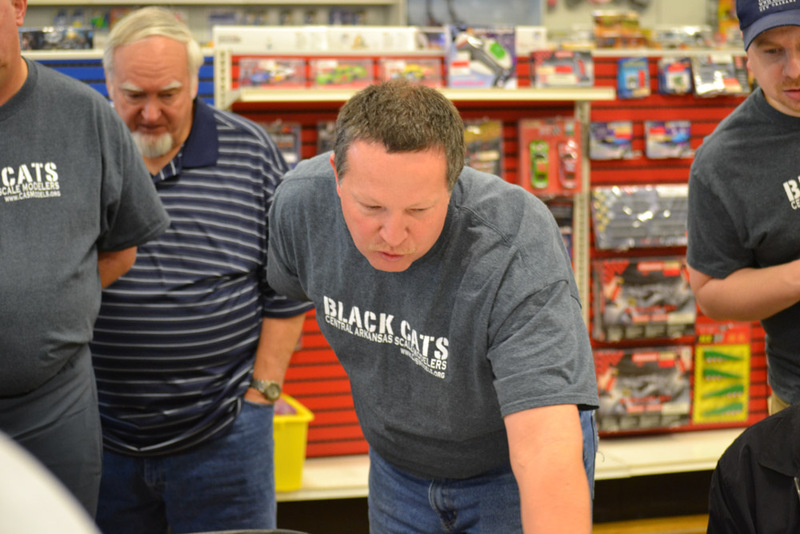 Hobby Town: Roger reported that he had several tubes of free model cement for anyone who was interested. Several items are still on clearance including same diecast kits. Pulaski Tech College Model Classes: The next PTC model classes will be Jan 12 and 26 and Feb 9 and 23. 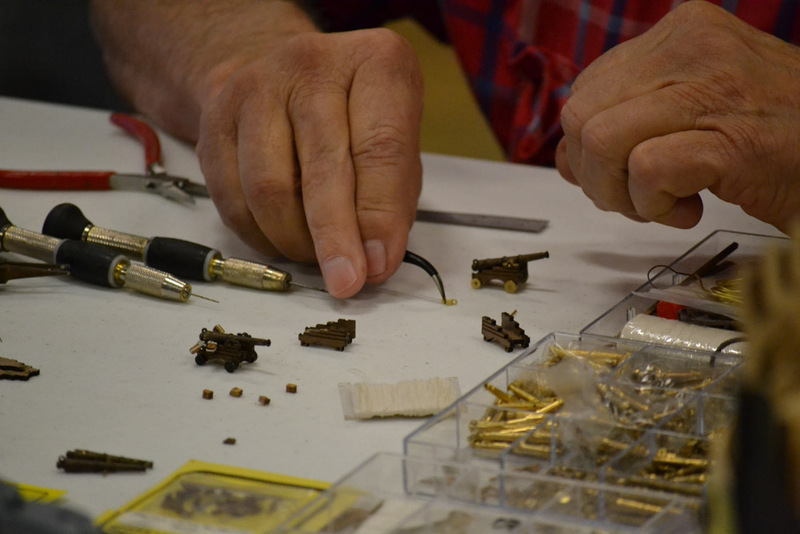 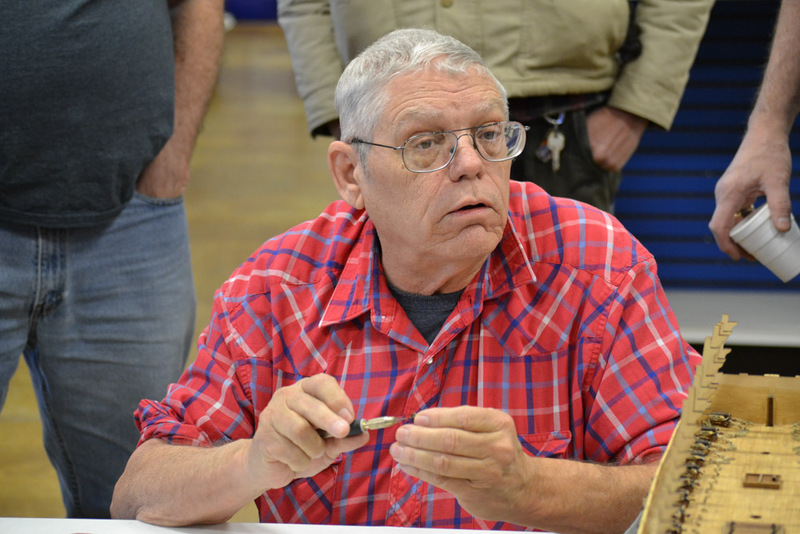 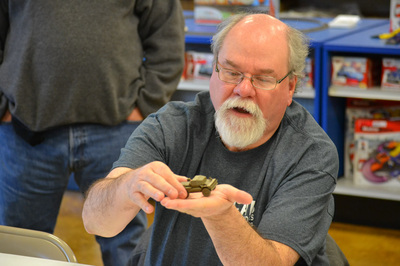 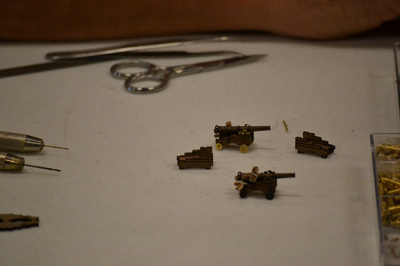 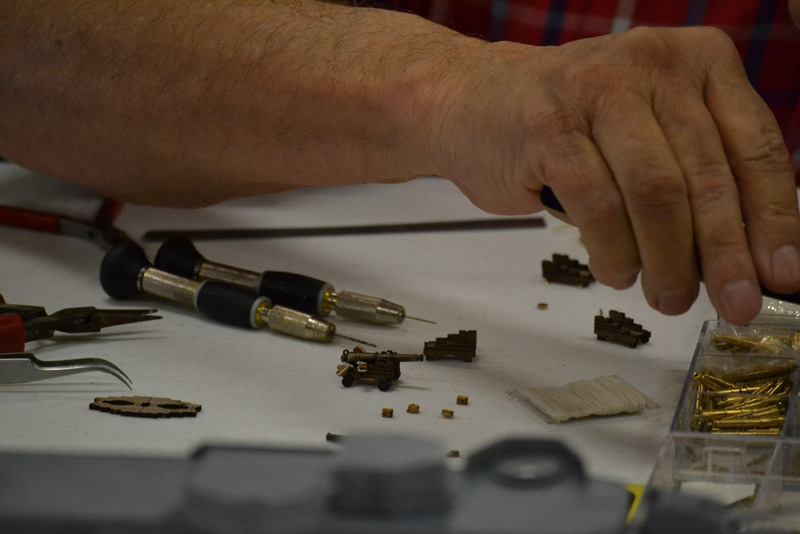 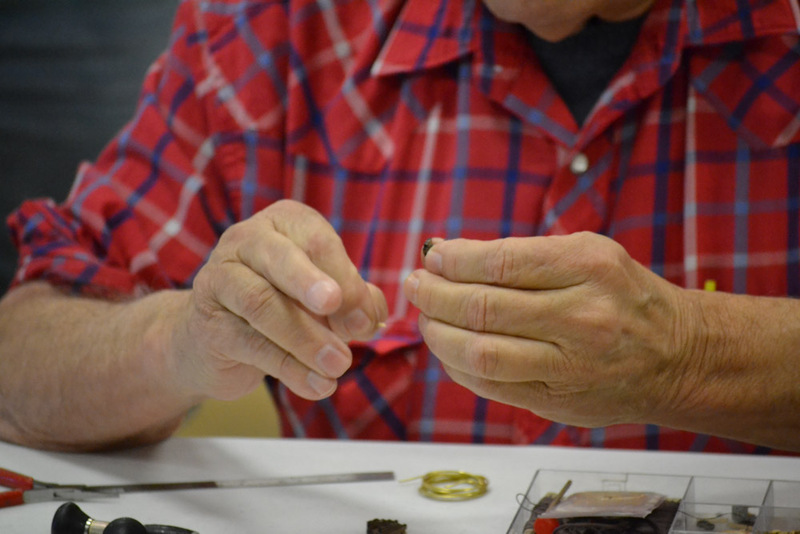 Bob Hiatt gave a detailed demonstration on building cannon for Napoleonic Era warships. 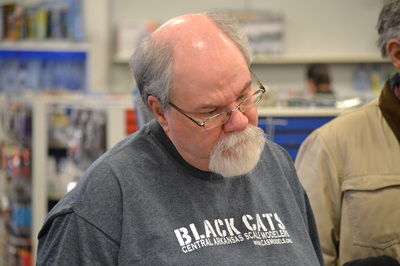 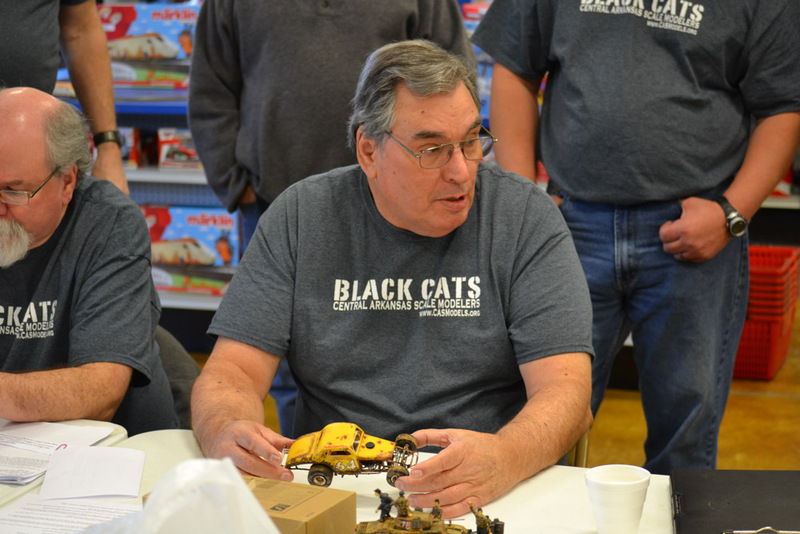 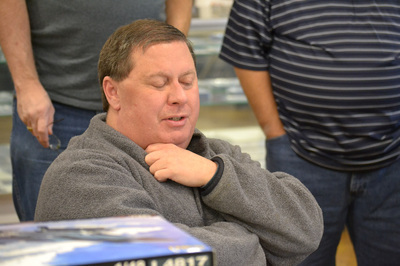 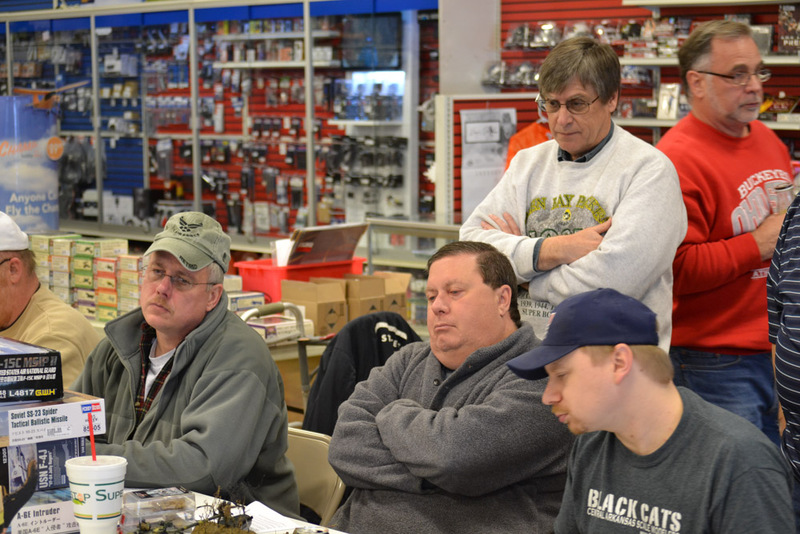 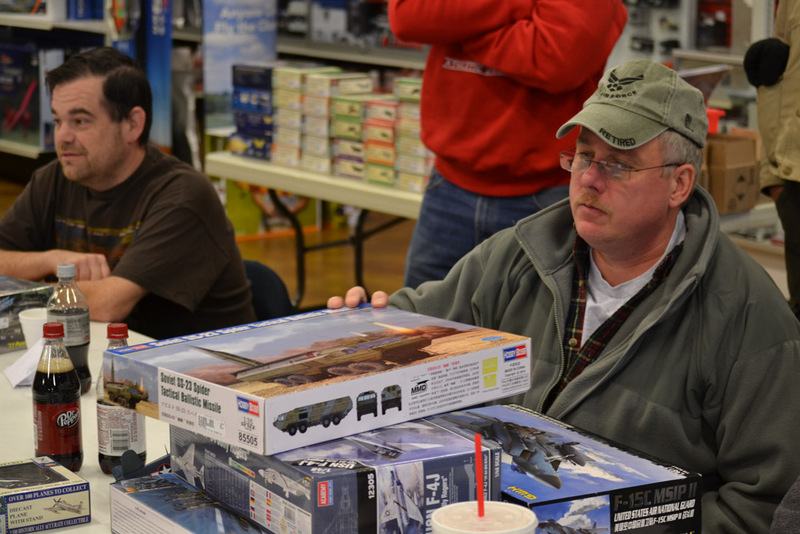 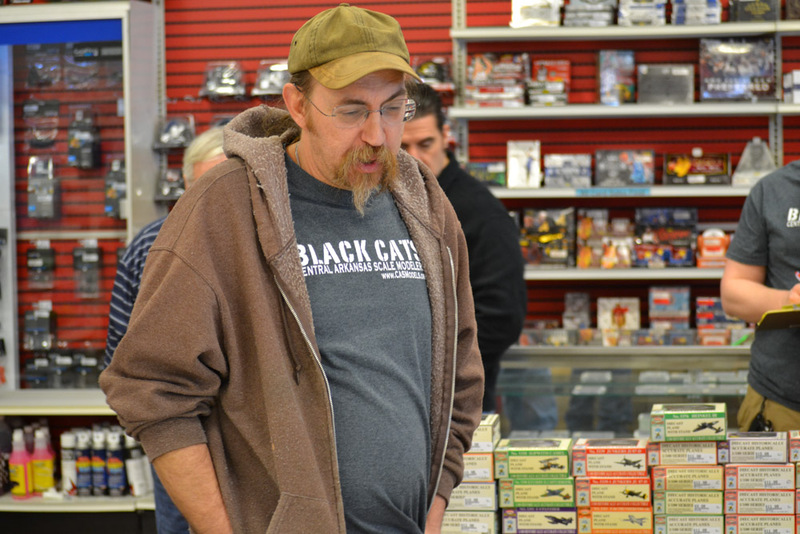 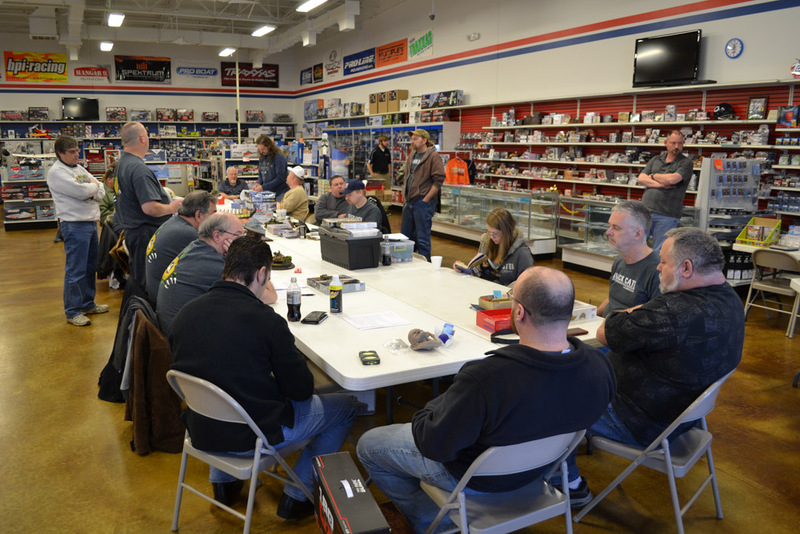 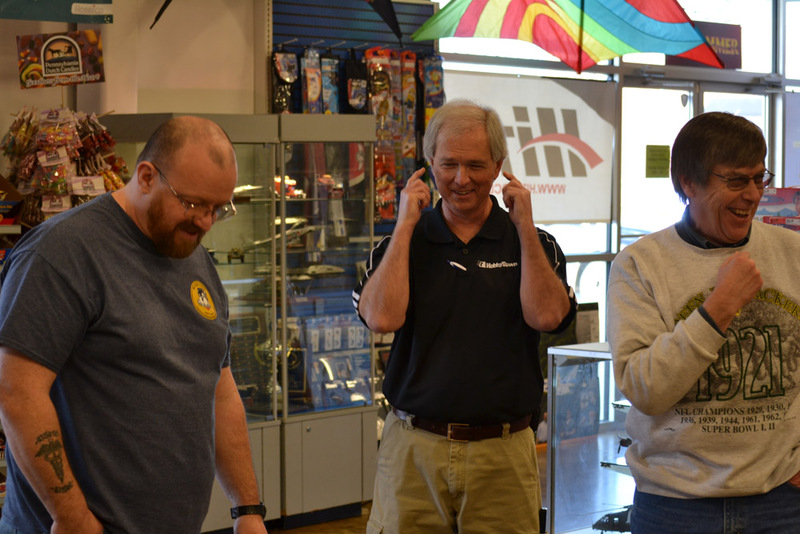 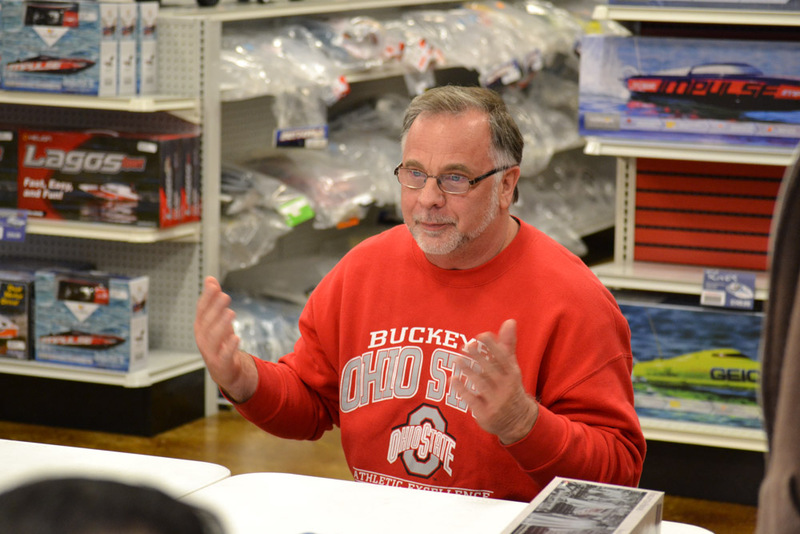 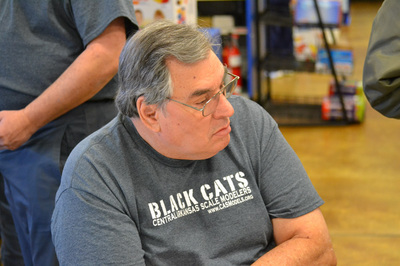 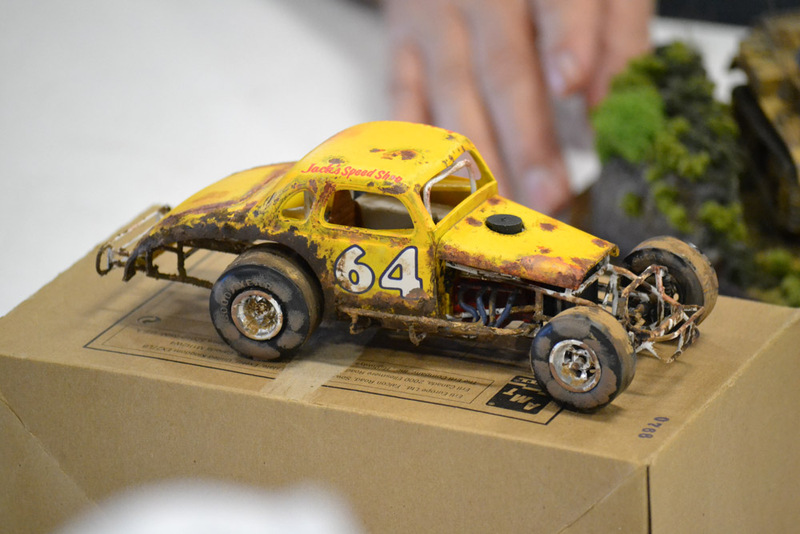 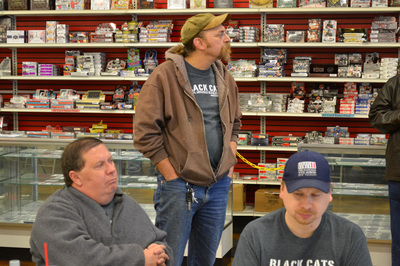 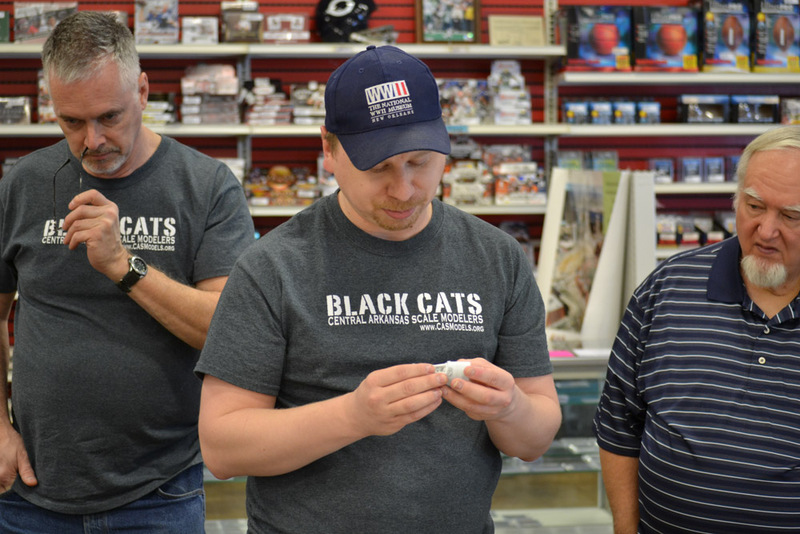 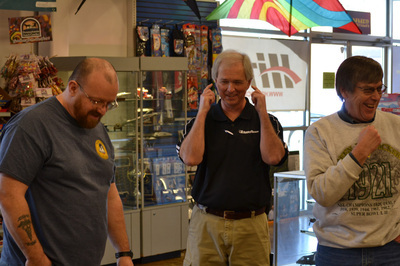 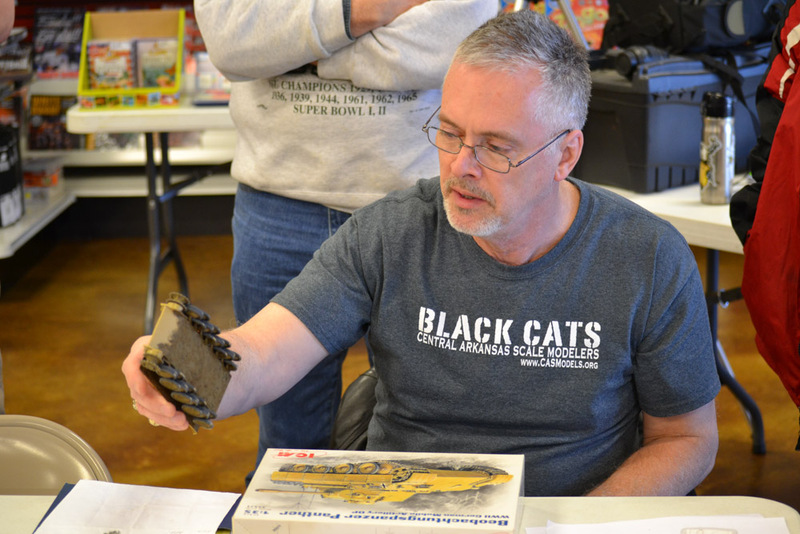 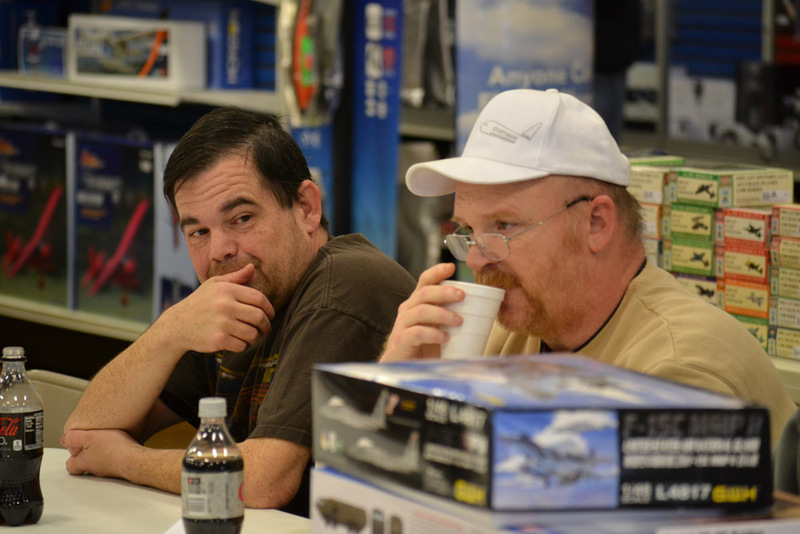 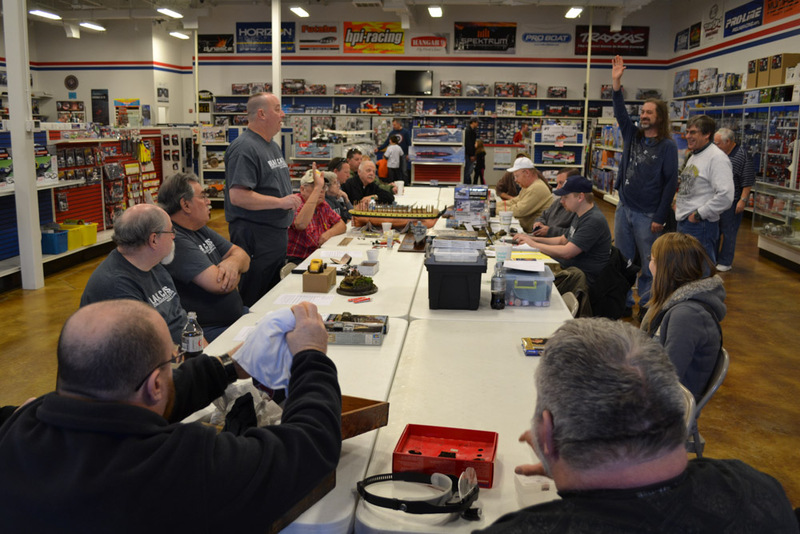 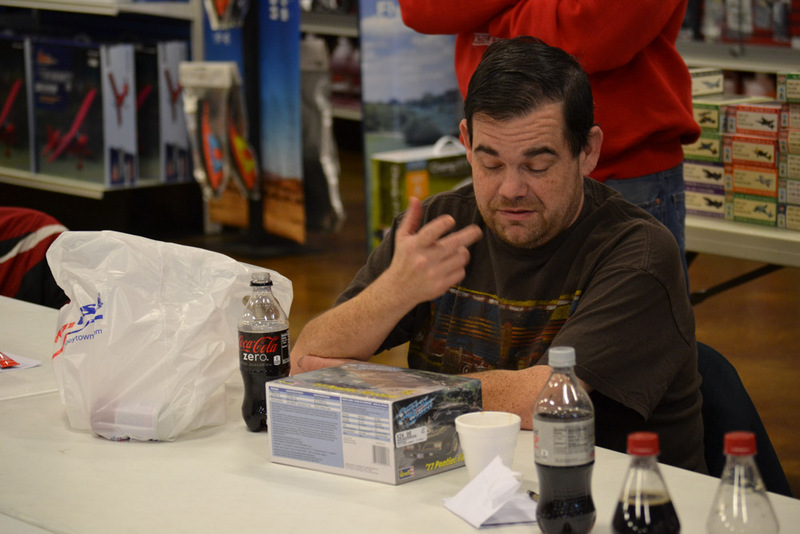 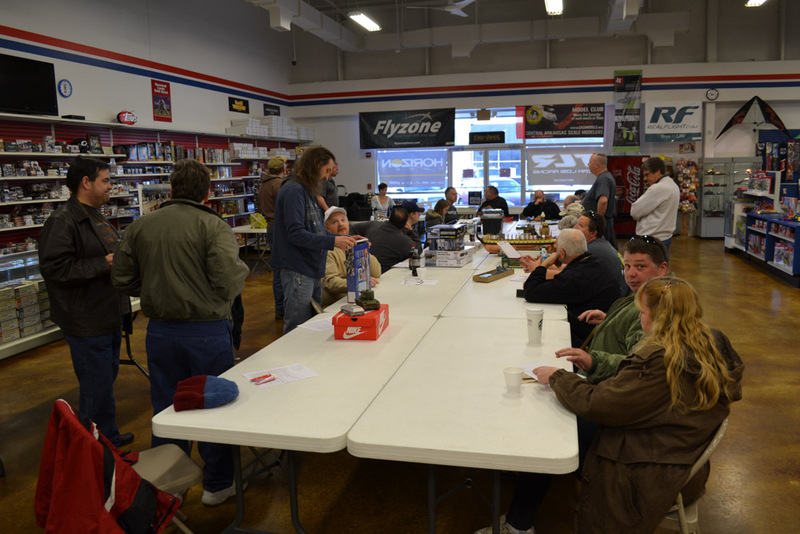 Richard Buzbee presented a Tamiya 1/48 Puma Sd. Kfz. 234 and a WIP 1/35 Trumpeter T-90 tank diorama with Vesta figures. 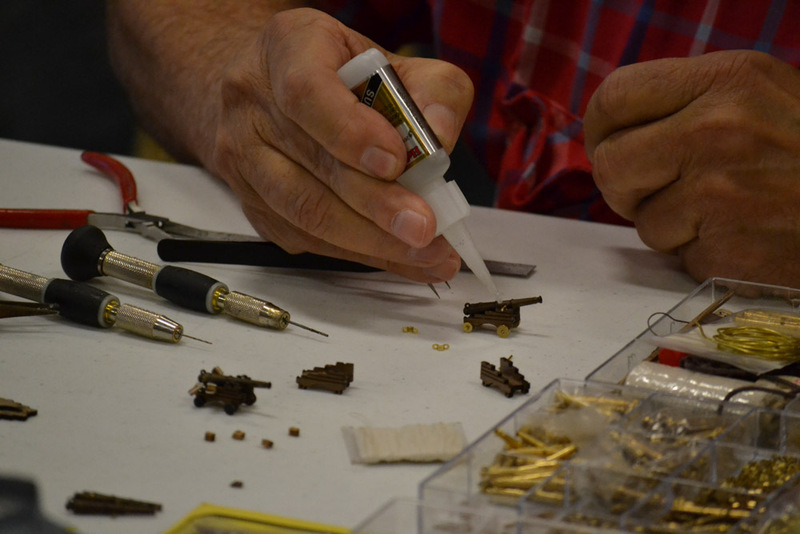 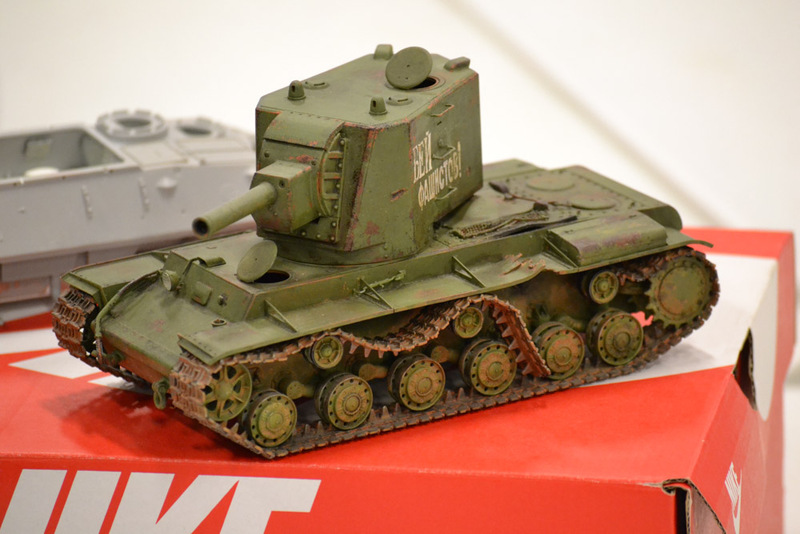 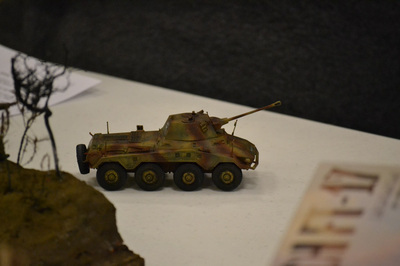 John Montgomery presented a Trumpeter 1/35 KV-2 and a Trumpeter WIP LAV. 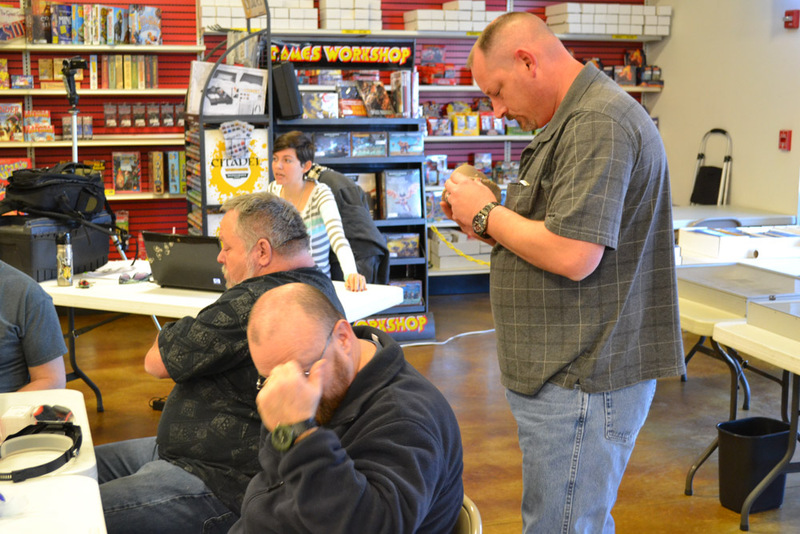 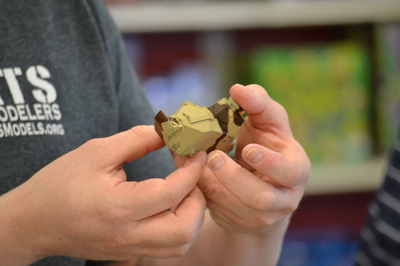 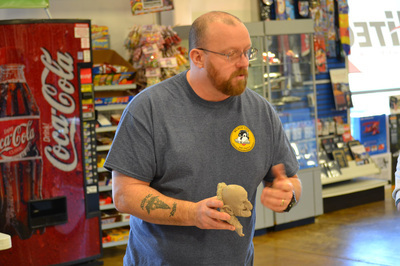 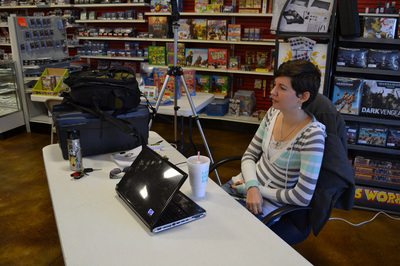 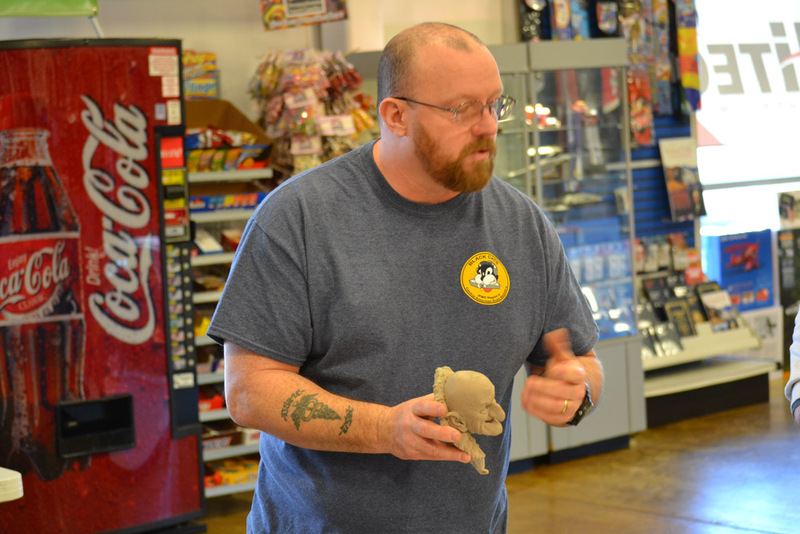 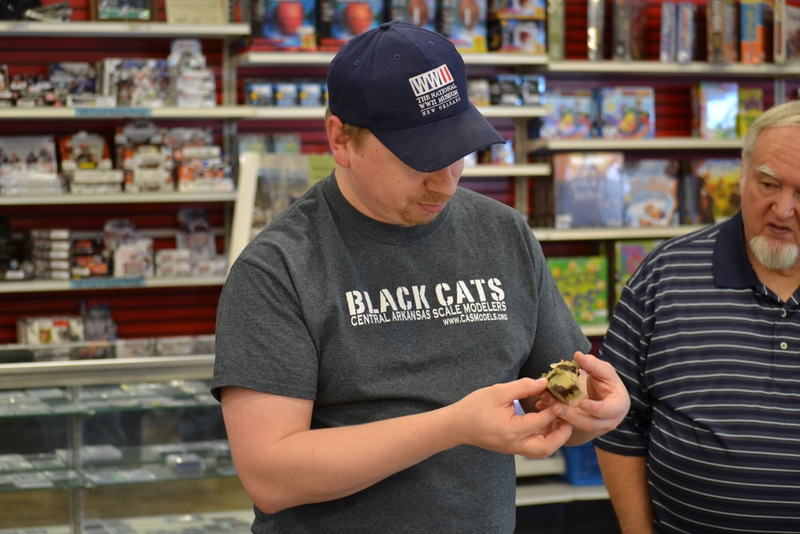 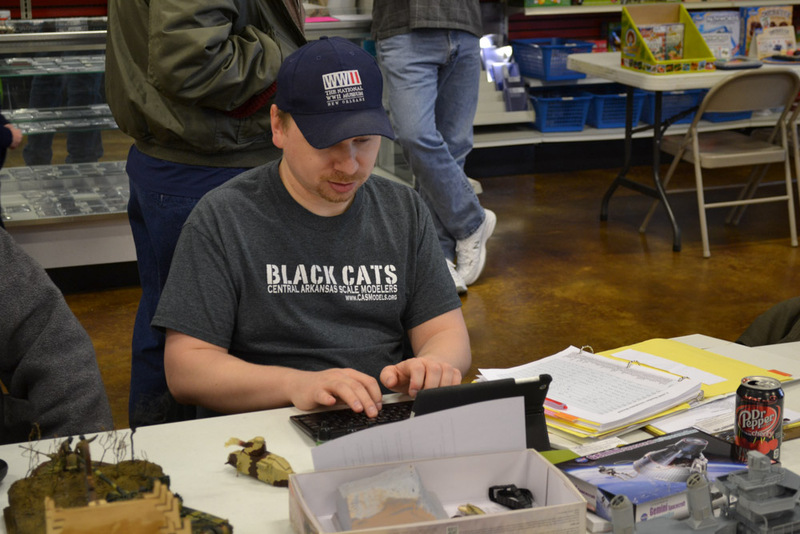 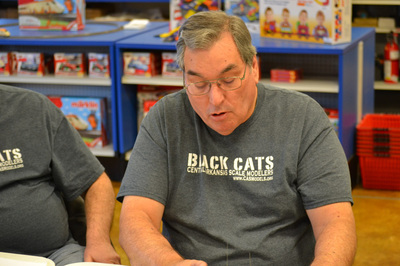 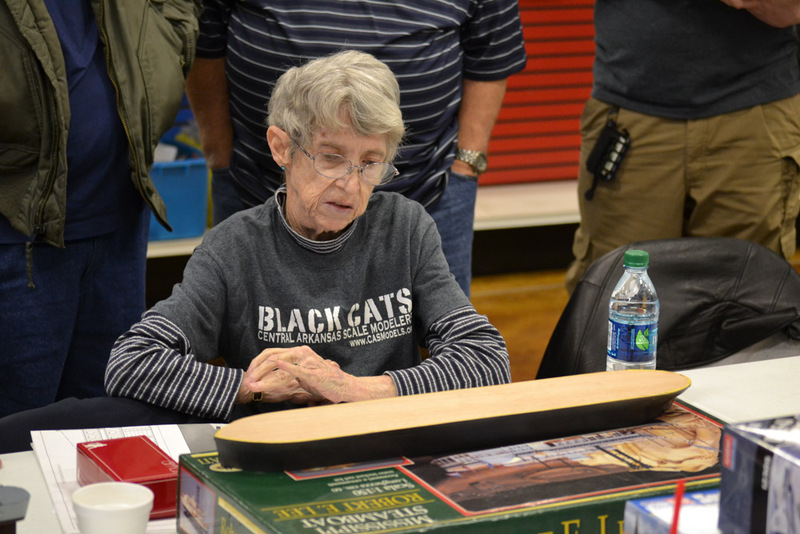 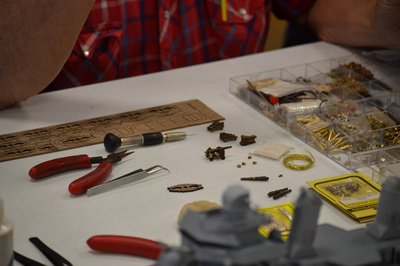 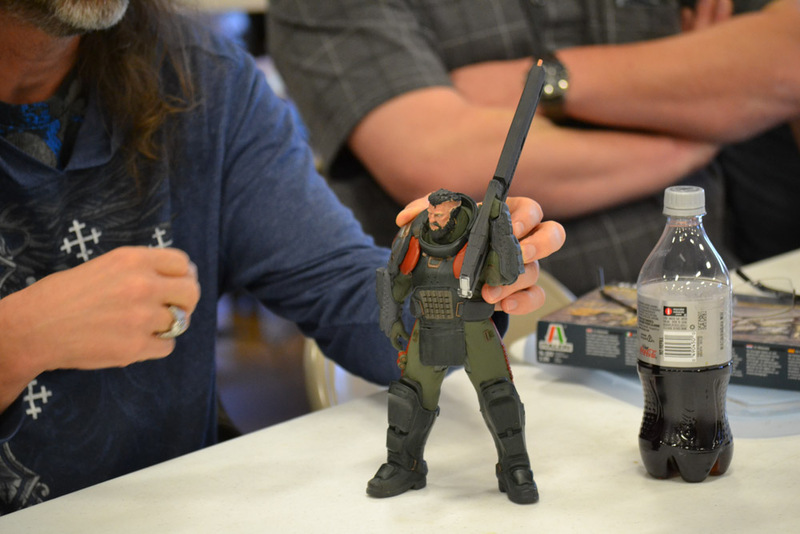 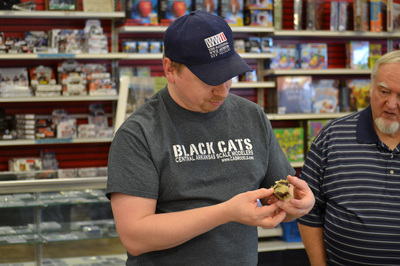 Ron Leker presented a WIP Black Moth figure and NIP Masterbox Zombie figures. 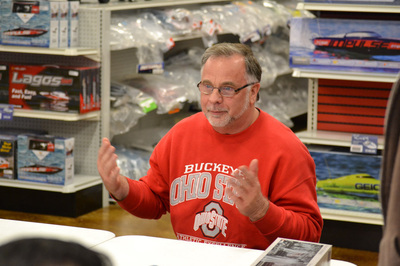 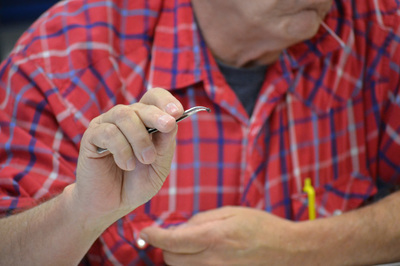 Ken Childres presented tarp and vehicle soft side moldings that he is submitting to a factory for reproduction. 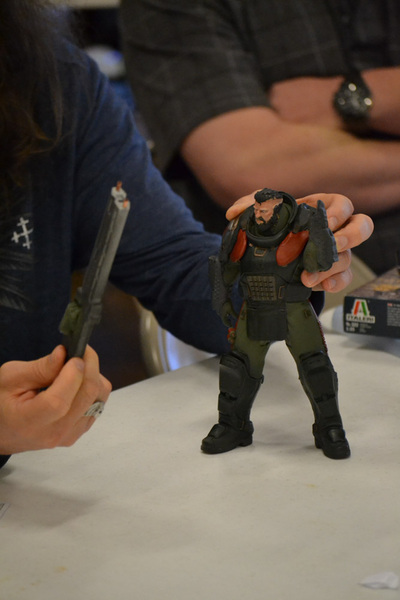 Matt Bond presented a WIP Men FT-17 and a WIP Dragon 1/72 Gemini capsule. 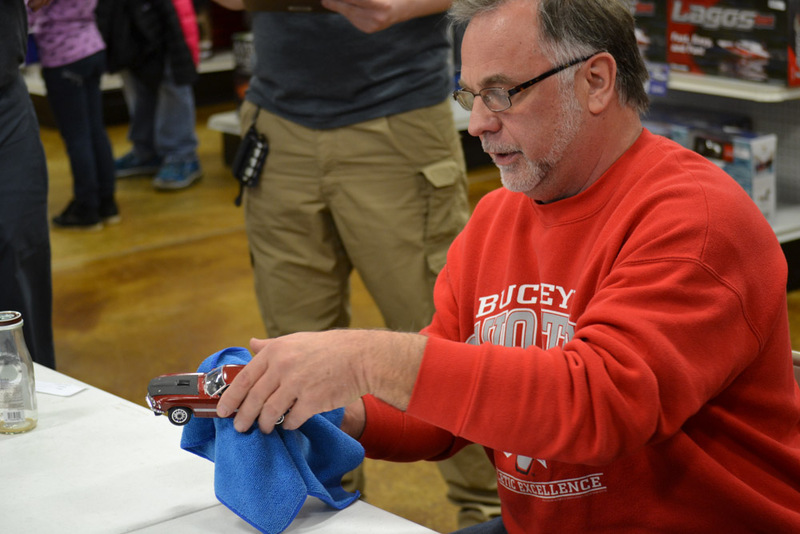 Kenneth Faucet presented a NIB Revell 1/25 1977 Ford Pontiac Firebird. 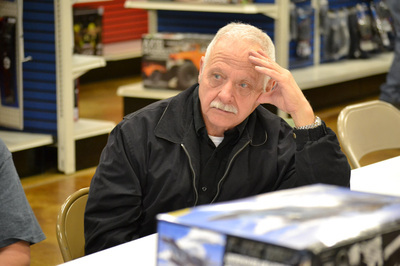 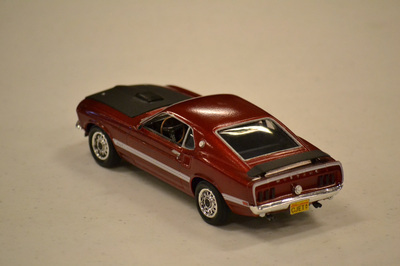 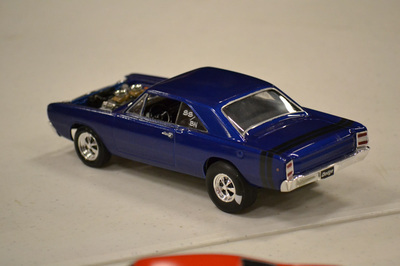 David Mizda presented three classic car models; a 1/25 MPC Hemi Thunder, Revell 1/25 Hemi Dark, and Revell 1/25 1969 Mustang. 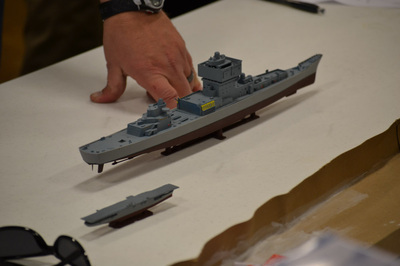 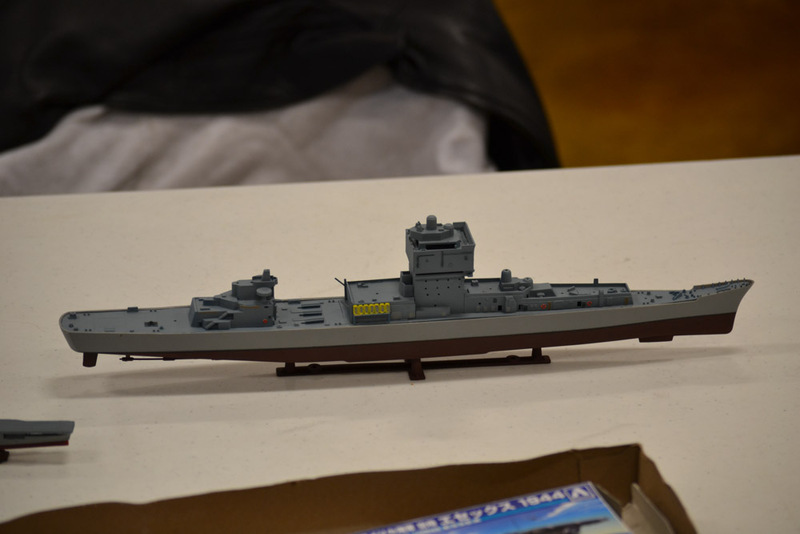 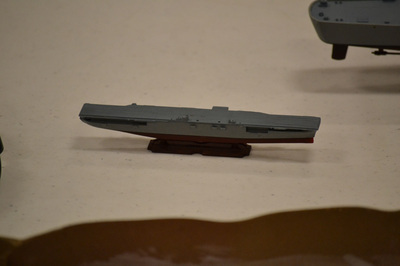 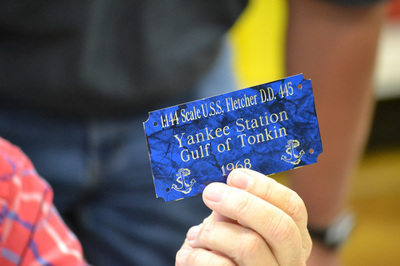 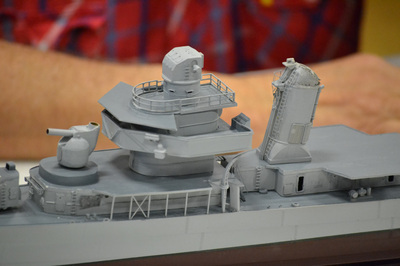 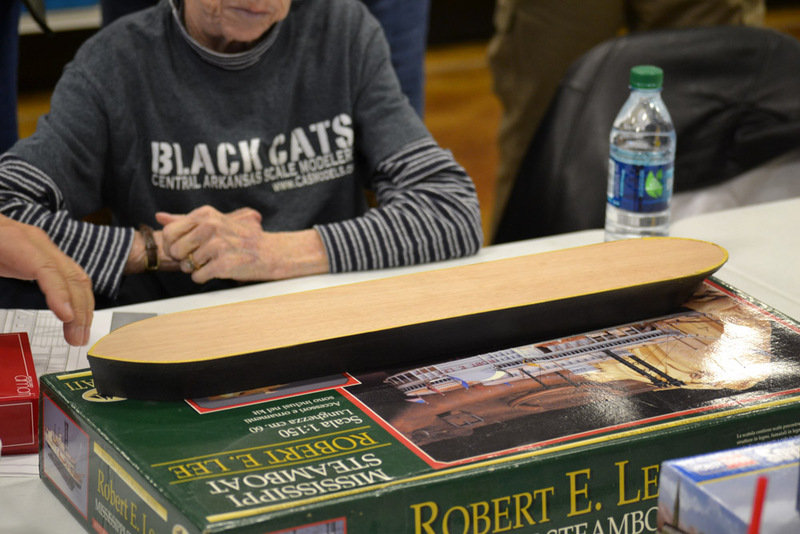 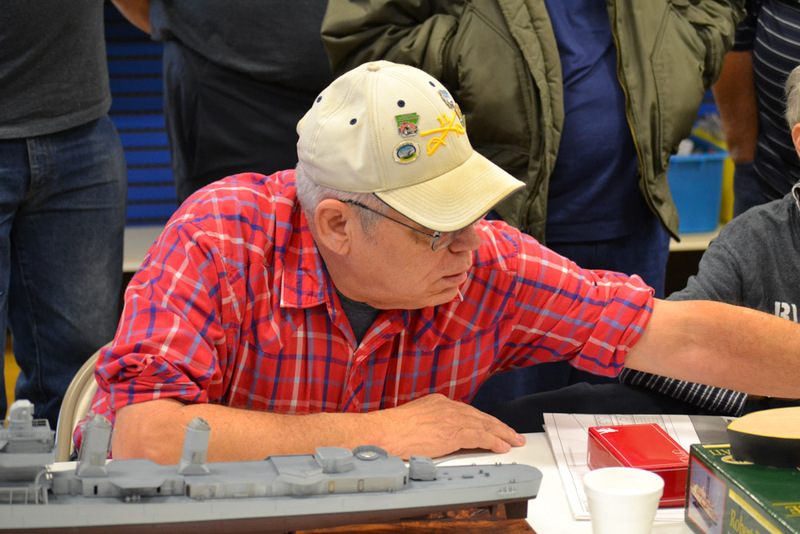 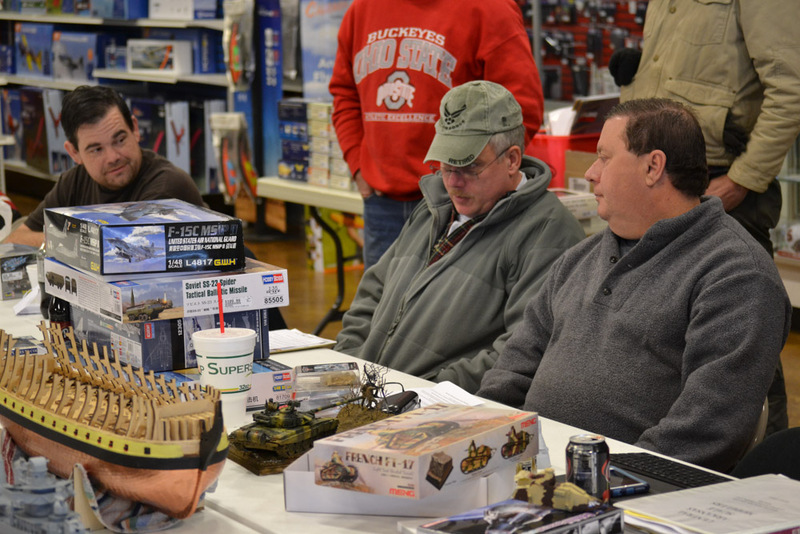 Robert Garton presented a WIP 1/500 Revell USS Longbeach and a WIP Ashima 1/2000 USS Essex. 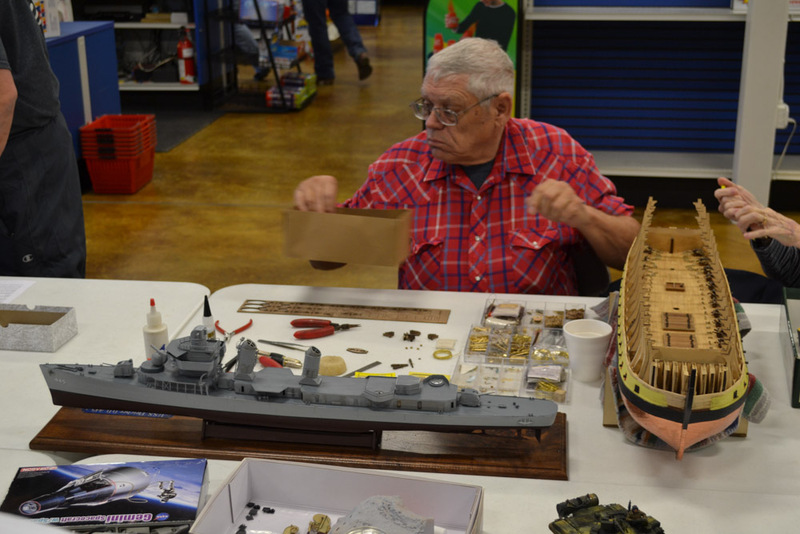 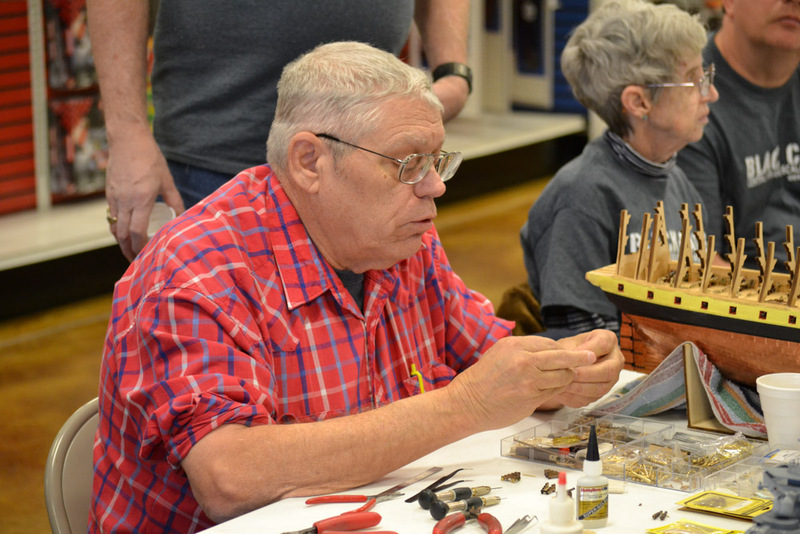 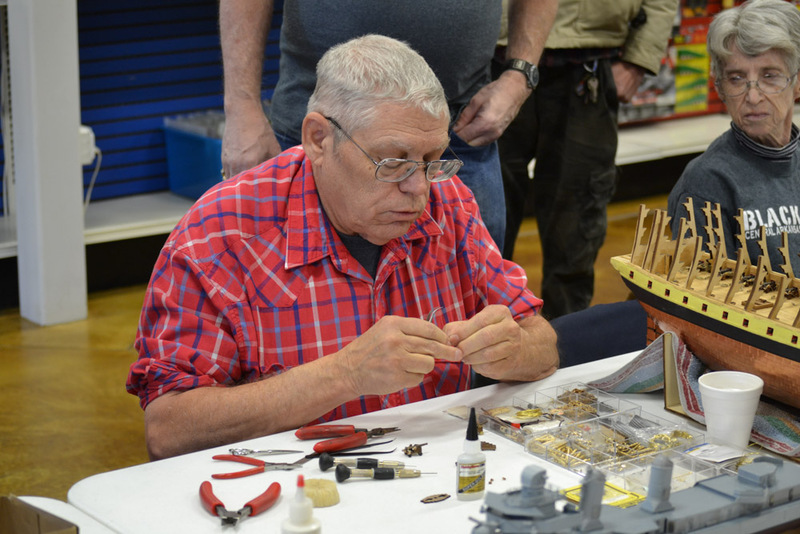 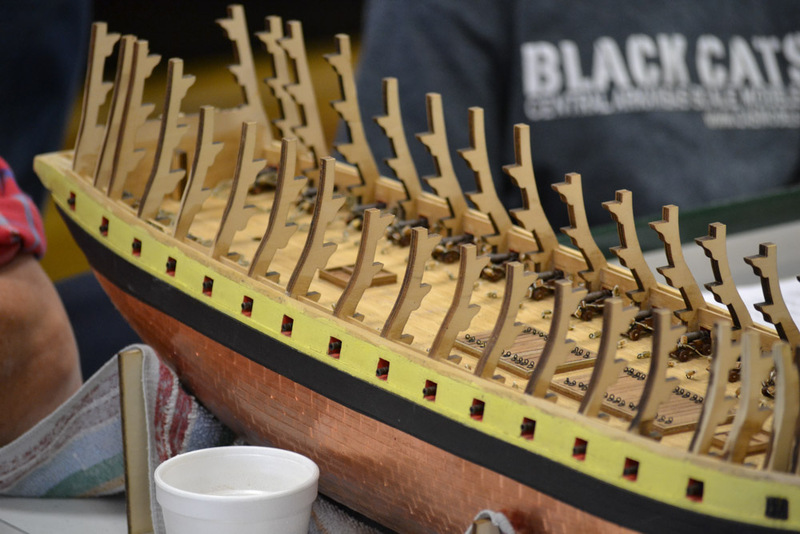 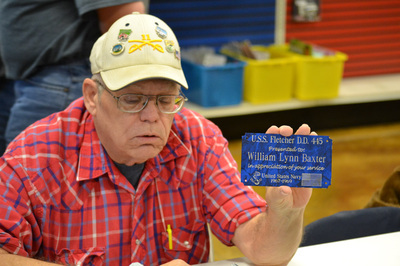 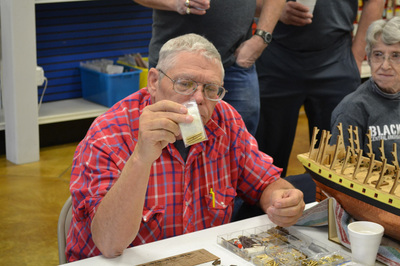 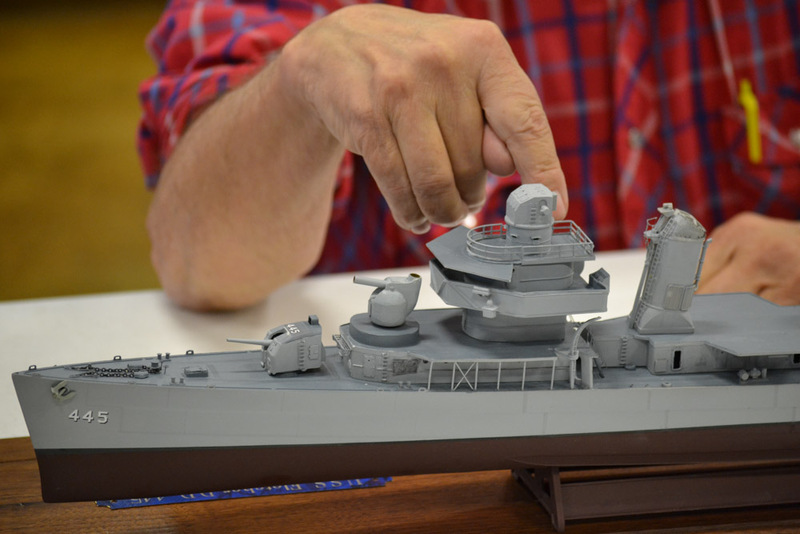 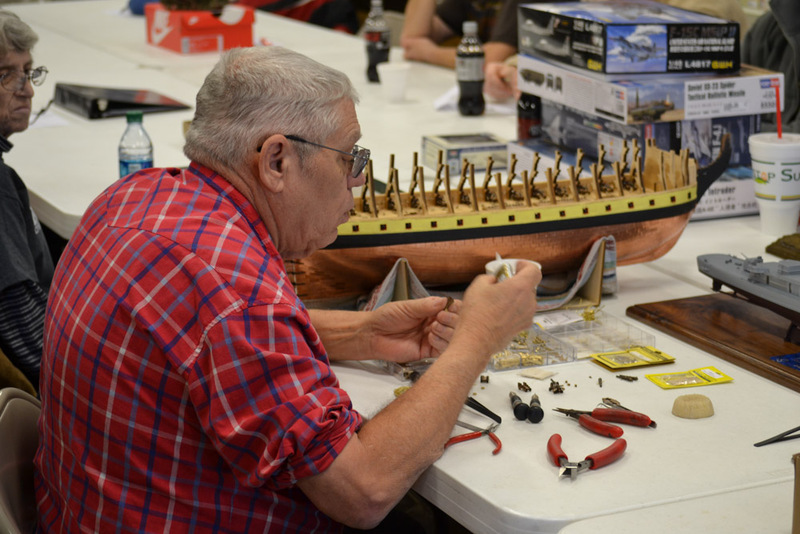 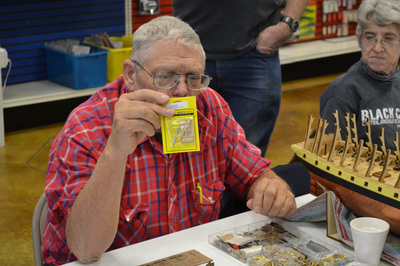 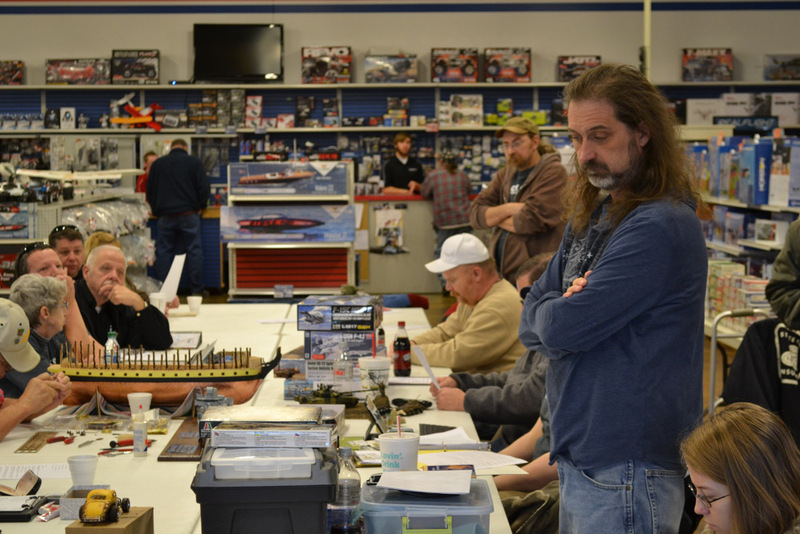 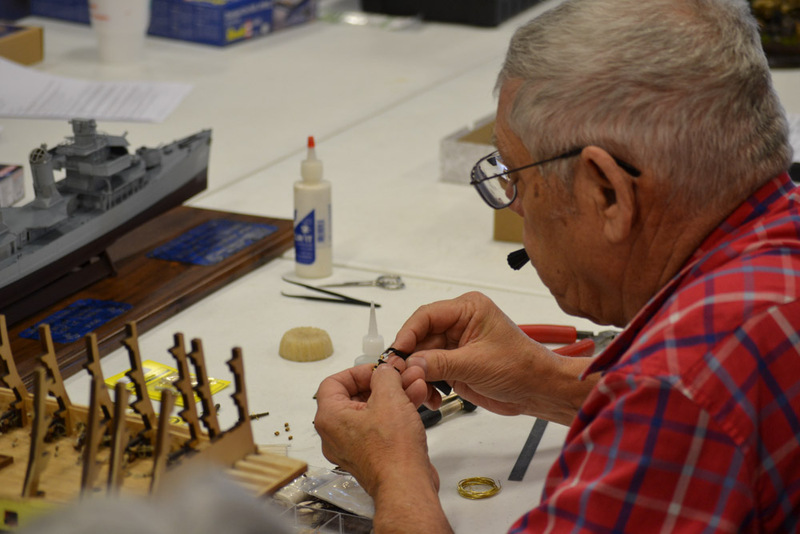 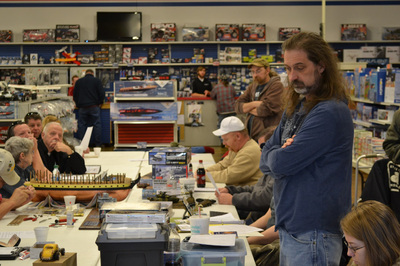 Bob Hiatt presented a WIP Revell Germany USS Fletcher and WIP HMS Victory. 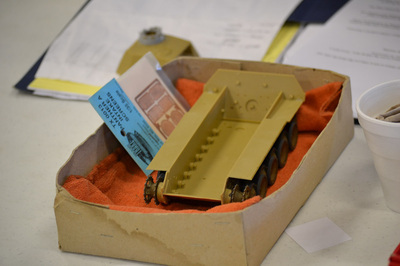 Cliff Bullock presented a ICM 1/35 Panzer II Ausf L and a AMT 1/25 1937 Chevy Modified Racer. 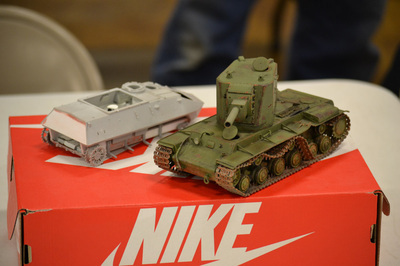 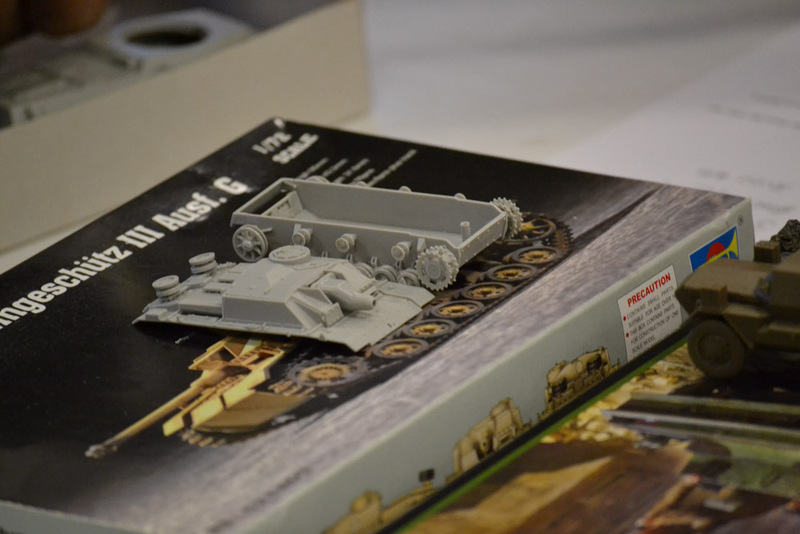 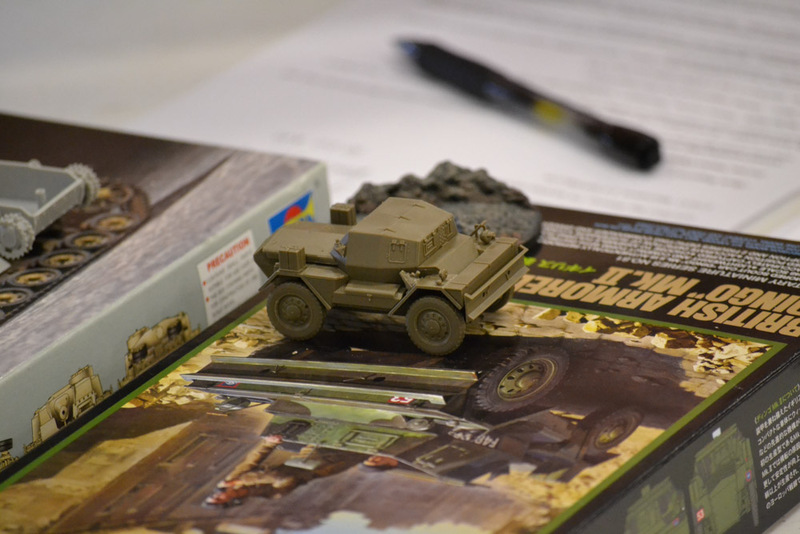 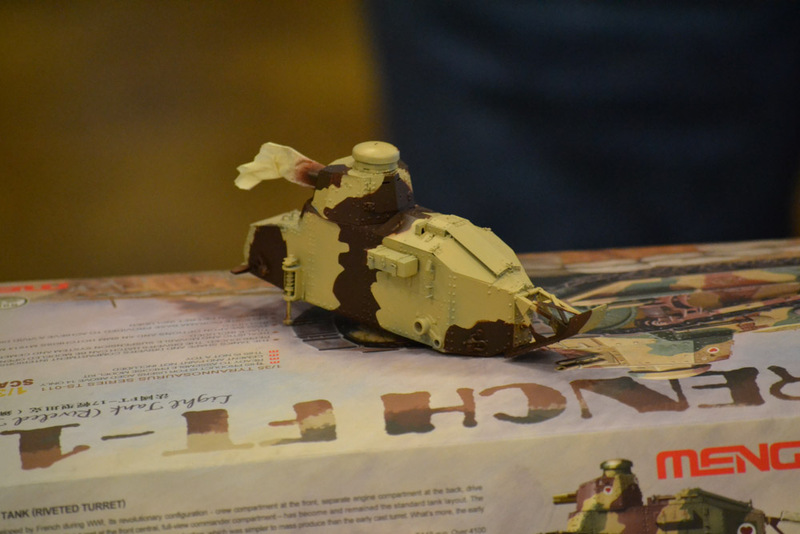 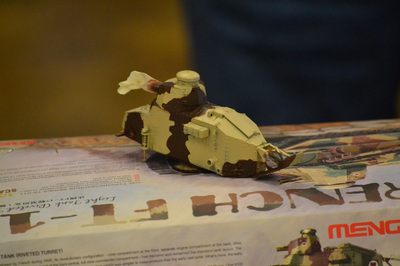 Mike Warren presented a WIP Tamiya 1/48 Dingo and a WIP Trumpeter 1/72 Stug IIIG. 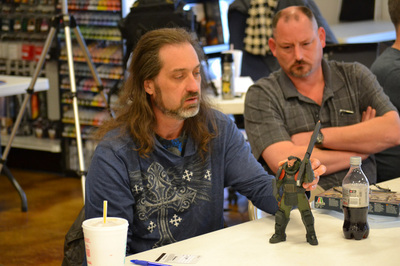 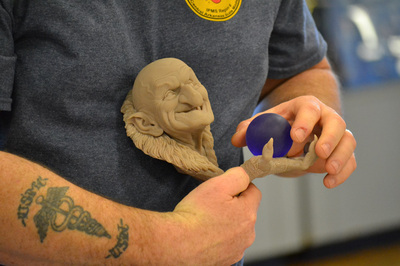 Rusty Nail presented a WIP Hogwitch Bust and a Blade QX HD Drone. 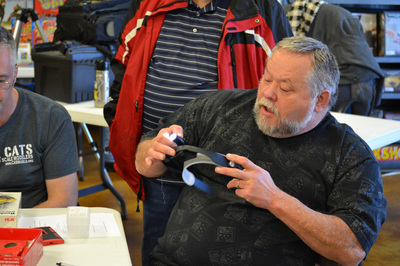 Steven Wilson presented a Carson Visor with build in LED light and pop-in lenses. 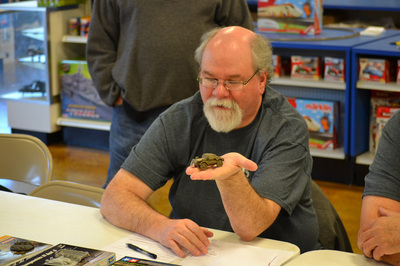 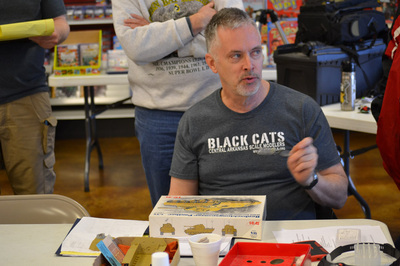 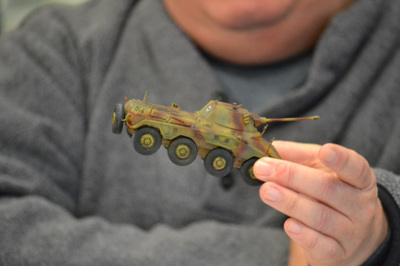 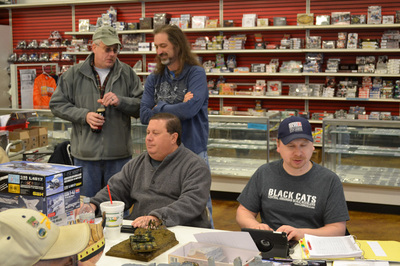 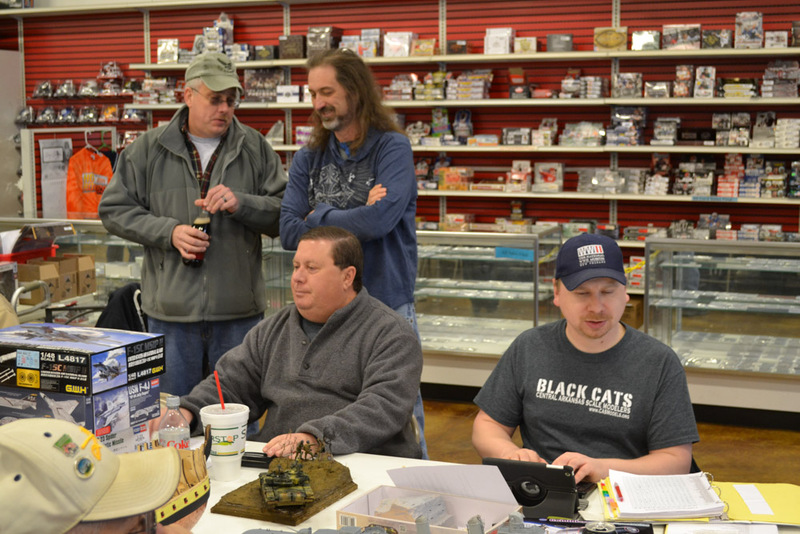 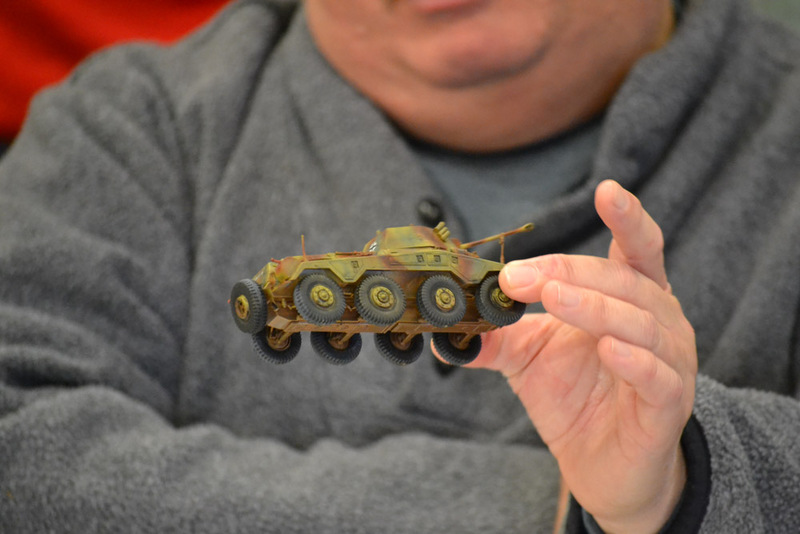 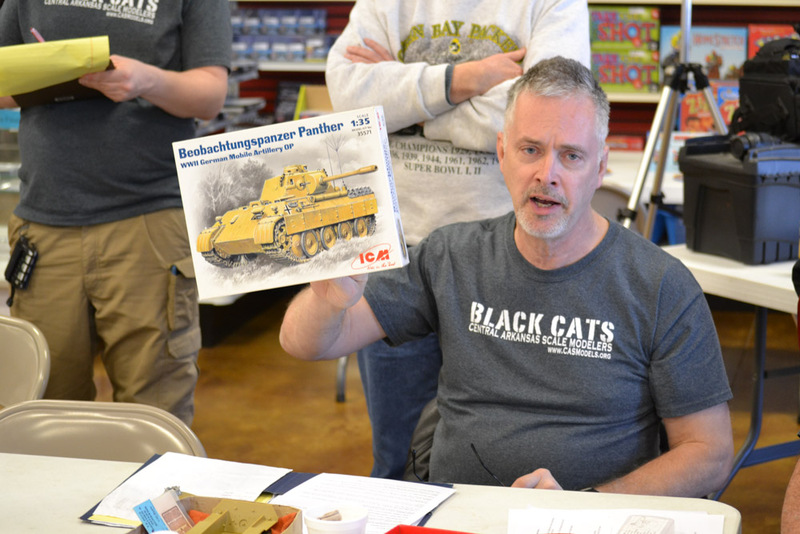 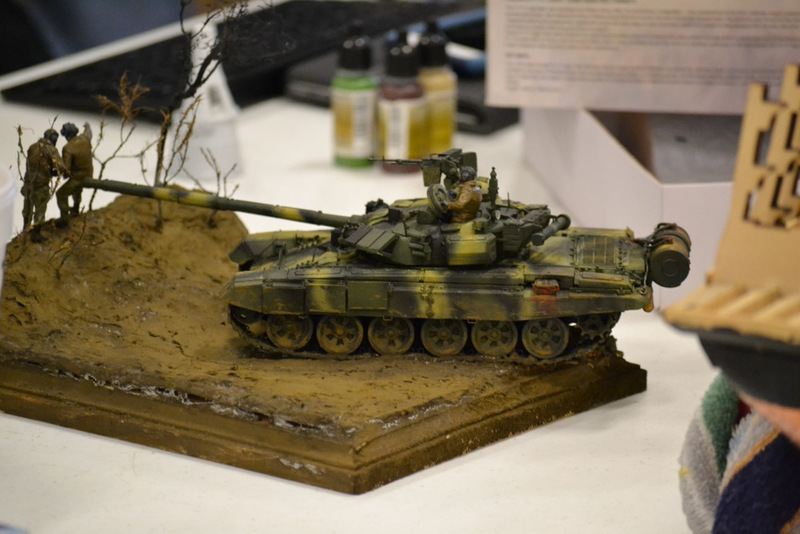 Rick Knapp presented a WIP ICM 1/35 Beobachtungapanzer Panzer German Mobile Artillery OP. The meeting was adjourned at 11:37.